Like raisins and chocolate, peanut butter and jelly or Morrissey and Johnny Marr, burgers and beer go together like... well, burgers and beer. They're so sympatico that when these kissing cousins aren't served together, something always feels strangely amiss. Stout Burgers & Beer knows, and capitalizes on, that classic pairing. God bless any eatery on the Cahuenga corridor that isn't totally heinous, trendy and overpriced. 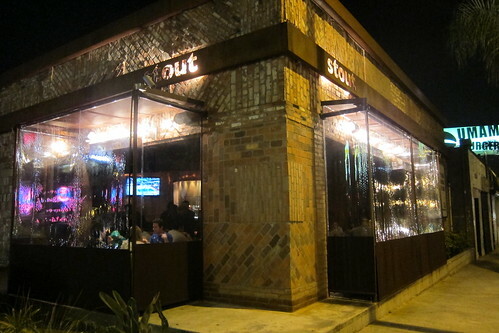 Located in the same strip mall as Big Wang's, Stout is trendy. 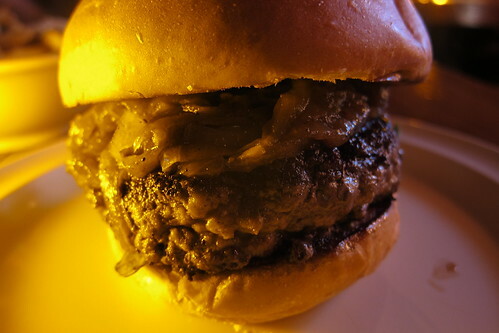 Its burgers, however, cost only $10, definitely on the lower end of the gastropub price range. More importantly, they're good enough to brave Hollywood's nearly intolerable traffic and exorbitant parking rates. Toppings: These are all chef-concocted burgers (i.e. you can remove toppings but can't add them), the best of which is, hands-down, the eponymous Stout Burger. Stout does Father's Office one better, serving their burger with blue cheese and gruyere. Caramelized onions? Check. Thick-cut, rosemary-tinged bacon? Check. Horseradish sauce? Back up. It's a perfectly fine horseradish sauce, but it's sharp and relentless, drowning the other flavors. The burger is better off without it, which is why we prefer our horseradish on the side, as a dipping sauce for the fries. Stray from the Stout Burger, and you may regret it. 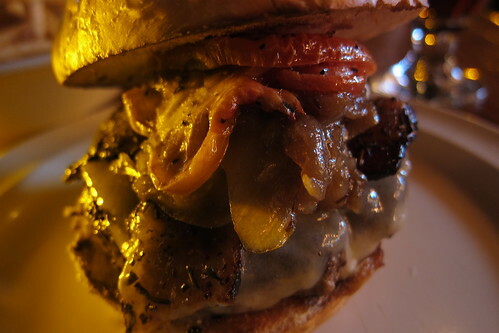 The Six Weeker, with its sweet caramelized onions and gooey fig jam, comes closer to dessert than any burger should. And the underlying arugula doesn't do anything but add a discordant earthy note. Sides: The skinny fries ($4) are cooked medium-well with a sprinkling of green oregano and parsley, giving them a unique herbacious kick. 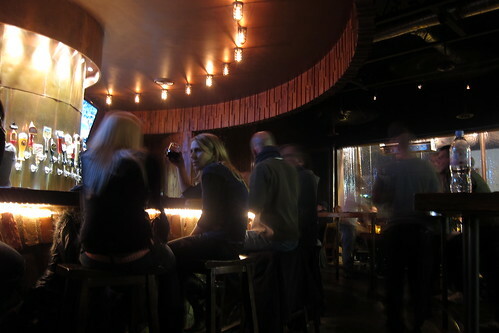 The best side at Stout, inevitably, is a liquid one. If you already know plenty about beer, the suggested pairings on the menu can be helpful, narrowing down the 30 on-tap beer options. If you're a beer neophyte, they can be confusing. The suggested pairing for the Stout Burger is a "malty, high-alcohol beer such as an IPA or a barley wine." Great. But which one of the malty, high-alcohol IPAs on the menu might work best? Even if you make an ill-advised marriage -- say a sweet Six Weeker with a Duchesse de Bourgogne sour red ale -- it's still burgers and beer. You can't go too far wrong. Dessert: We hear the chocolate bread pudding is killer, but we burned through our calorie allotment with the beer. This is almost certainly our loss. The Upshot: Order the Stout Burger medium-rare with the horseradish sauce on the side. Get a side of fries. Go crazy with the beer.